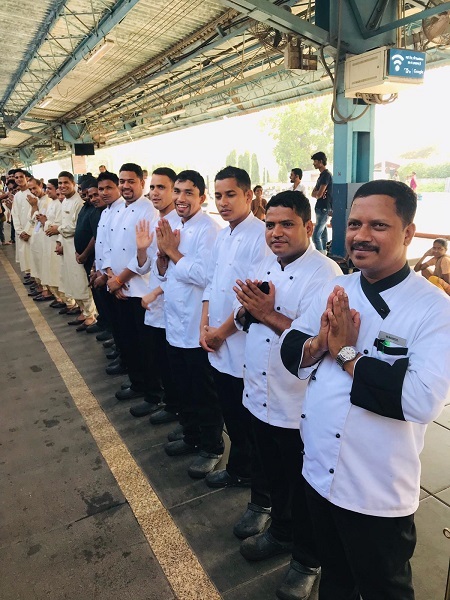 Charlotte Robson, Assistant Manager of our Westbourne travel agents, travelled to India to experience the luxury train known as the Deccan Odyssey. On a round-trip from Mumbai, she got to see some of the more rural areas in places such as Goa, meeting some inspiring people along the way. Here is her journey in her own words. We arrived into Mumbai in the morning and transferred to the Leela Hotel for a hosted lunch and site expectation. The hotel boasts 396 rooms and suites, including executive suites and premier pool views. Levels seven and eight are the club levels for guests. This is one of the oldest luxury hotels in Mumbai and it’s great for an airport stopover or if you want to explore. There are four restaurants, three of which offer speciality dining. That afternoon, we took part in a three-hour Bollywood Tour. We went through the whole production of a movie from acting, dance and editing to the final product – which generally takes up to a year to produce. We had lots of interactive fun as we experienced the filming of the folklore and disco Bollywood dancing, as well as all of the different film sets used. The group took part in a clip of an Indian television programme which was aired the following week. At the end of our busy first day, we transferred to the Taj Mahal Tower where we spent our first evening amongst the amazing heritage of the spectacular Taj Mahal Palace. We were staying in the new part of the hotel which is more modern and has a more contemporary style of decor. The journey from the Bollywood studios took us to the southern part of Mumbai through the hectic city. On arrival, we sampled some local cuisine in a restaurant outside of the hotel. This morning, we had breakfast at the hotel and met with management to explore the site. It was built in 1903 with 285 rooms within the palace and later, in 1970, a further 258 rooms were added in the tower. They have six restaurants throughout the two buildings – all with a selection of cuisines. This hotel is so colonial and has such a unique, iconic structure. Throughout the building, your senses are tempted with the smells of incense, spice and floral notes. The Rajput suite was stunning; so opulent with rich furnishings with a ‘small’ price tag of £7,000 per night! It’s used by many celebrity guests and royalty, including Kate and Wills. The Tower Hotel is much more modern and contemporary, with beautiful light and airy rooms that offer amazing views across to the Gateway of India. We headed out for a guided tour of Mumbai’s iconic sights, passing several heritage sights and places of interest, such as the high court, the University of Mumbai, the famous clock tower, the town hall and Victoria Station. We stopped on route at the famous hanging gardens and came across the open-air laundry at Dhobi Ghat. They have several of these but this one has over 5,000 staff. We travelled on to the famous Gandhi Museum, housing over 40,000 books either written by Gandhi or written by others about him. Late afternoon, we transferred to the Victoria train station to board the Deccan Odyssey for our seven-night train journey. We received a warm and lively welcome with local dancers and musicians and were all given jasmine wreaths as we boarded the iconic train. Later, we enjoyed a lovely dinner in the two dining carts they have, serving international and local Indian cuisine. The Deccan Odyssey runs five different itineraries through India. The train has 16 carriages with cabins and two presidential suites which accommodate up to three adults or a family with two children over 10 years. This room automatically comes with a private guide and car when exploring each destination on the itinerary. You are able to make all of the journeys flexible and have a private guide instead of being with the group. We wake up in Nashik, the wine capital of India, which is also known for its sugarcane production. The area is situated north-east of Mumbai and located on the banks of the River Godavari and today we visited the Godavari Ghats, observing several Hindu rituals by the local people. 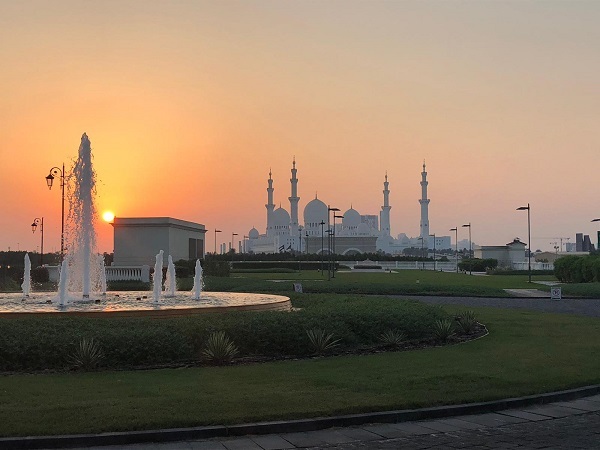 The guide, Chandna, takes us on a walking tour around this area, giving us an explanation of the Hindu religion whilst soaking up the local way of life. Mid-morning, we travelled inland for about 40 minutes to the Grover Zampa winery. In this area, they produce 36 different wines and we were guided through the whole production process from the vineyards to the storing of the barrels. The group had a professional wine tasting before being served lunch. We arrived into Aurangabad “the poor man’s Taj Mahal” and famous for the rock-cut temples. Leaving the station, we drive around 40 minutes to the Ellora Caves excursion. This was the first of 29 UNESCO World Heritage Sites in India. We passed the ancient Daulatabad Fortress which once housed a king and its people. It represents three different religions, was discovered in early 1819 and is still a place of worship today. We transferred back to the train to be served lunch and then had a free afternoon with a lecture from the Deccan Odyssey train manager. After an early start, we arrived into Ajanta to start our journey to the Ajanta Caves, a drive taking roughly an hour and a half. This land is predominantly used for farming, production of cotton and banana plantations. It’s a very rural location and feels very far from the chaotic city of Mumbai. Arriving at the Ajanta caves, we climbed 100 steps to reach the start of the tour. These date back to 30AD and are Buddhists temples set into the cliffs with 30 different worships sites. The guide gave us a full explanation and walking tour of all the transcriptions engraved into the amazing Buddhist creations. Langur monkeys are native to this area and roam around the caves. We travelled back to the station to have a late lunch and some free time for activities on the train. An early breakfast was followed by some free time for a short presentation from Sarah from Cox and Kings. We headed out after an early lunch for our afternoon excursion to the Marasha New Palace Museum, dating back to the 19th century. We arrived at a local hotel serving traditional afternoon tea where a local folklore dance was performed for us before we proceeded to the old Mahalakshmi temple. We enjoyed a local martial arts performance called “Mardani Khel” before returning back to the train to travel 352kms onto Goa. We arrived in Goa and disembarked the train to start our morning excursions. We visited the capital to see the Portuguese-influenced buildings and see how the Fontainhas (Portuguese colonials) used to live. This colony covered 3,700 square kilometres and makes up the smallest state in India, with 1.45 million people. The area produces many cash crops such as jackfruit, mangos, and cashew nuts. We passed through a local marketplace where all the fruit, vegetables and fish are sold daily. The beautiful UNESCO World Heritage churches still remain in the old section of Goa, some taking 11 years to build and the cathedral taking 90 years. We experienced the nature of a local plantation and a Goan feast for lunch, before a short tour around the Sahakari spice plantation. Further inland, we travelled an hour to a local Portuguese-style Goan house which took seven years to build to see how they once lived. It houses a museum of antiques and artefacts. The couple who live at this house use part of it for tourism and they provided high tea for us, complete with homemade savoury and sweet pastries. Finally, our day comes to an end by visiting one of the famous beaches of Goa, located in the southern region. It’s 21 kilometres long and this is where most of the best luxury hotels are with the beaches being private to the guests. There are also northern beach resorts, but these tend to be simple boutique properties or more private residences which are a lot quieter. It’s very easy to eat out in these areas and so most guests tend to do this so they can experience the local cuisine. This morning, we disembarked at Sindhudurg after travelling 154kms. We visited the Pinguli tribal village and watched a local puppet show performed by the family before lunch at the Sawanteadi Palace. Once we arrived at the palace, they gave us a tour of the Queen’s old palace, showing her own artwork as a young girl as well as her collection of favourite paintings from other artists. We were also shown a range of Indian games and local traditions before being served an Indian feast served in the grand hall. We ended our day with a dance performance by the local ladies from the nearby village. We transferred back to the train to have a farewell Bollywood party and all got to dress in traditional Indian attire. We arrived in Mumbai with our amazing guide Chanda, who gave us a walking tour of the city. 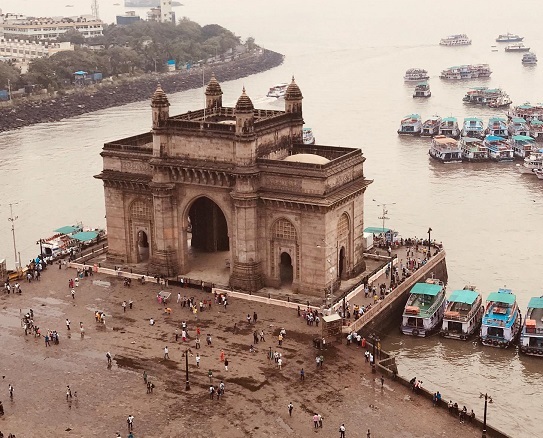 We started at the Gateway of India and took in some of the main points of interest before having lunch and transferring to the Trident Nariman Point Hotel for our last evening. I would most definitely recommend this as it’s such a beautiful and iconic way to travel through India. The cabin itself was very comfortable and I highly recommend the staff on board throughout the journey. 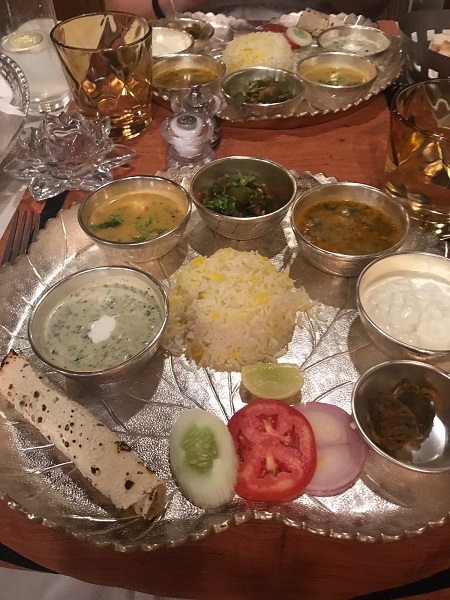 I want to give such praise to the chef on board who prepares a different menu daily for guests, consisting of both Indian and international cuisine. Overall, this experience has been one that I never will forget. India stays very close to your heart and even though, at times, I struggled with the poverty of the country, the people are still so friendly and so humble. The colourful sights, sounds and smells will remain a solid memory to me. 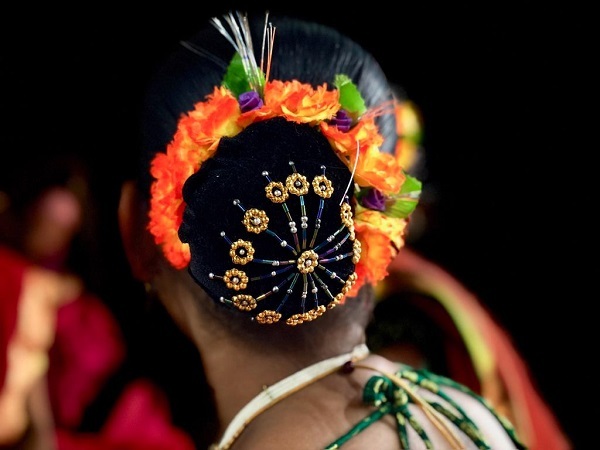 The fact that India has such a unique culture is likely to make you return again and again. If you would like to experience India this way, we can help you arrange your own luxury holiday on the Deccan Odyssey. Visit us in your nearest branch to talk to the team – we have travel agents in Ipswich, Norwich, Colchester, Bury St. Edmunds, Felixstowe, Westbourne, Bournemouth, Dorchester, Lymington and Christchurch.